Today Dave Sifry announced (also here) that effective immediately he was stepping down as CEO of Technorati and turning over the reigns to the CFO, VP of Engineering and VP of Marketing while the organization continues its search for a new CEO. 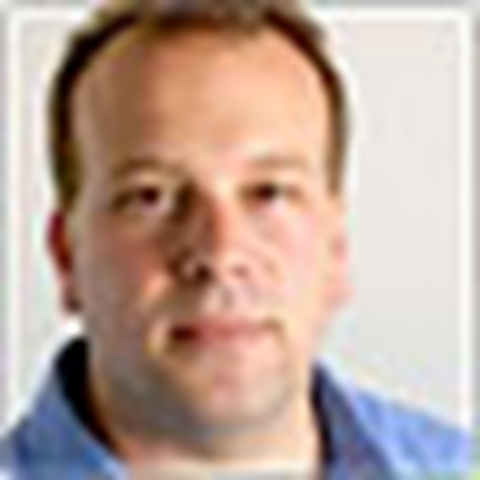 Dave will now take on the role of Chairman of Technorati's Board of Directors. In full disclosure, I should state that I've known Dave for quite a long time now. Back in the fall of 1998, it was Dave who offered an email mailing list from his brand-new startup then called LinuxCare (with a capital C) to a group of people who thought we ought to have a vendor-neutral professional certification program for Linux. Dave was later involved with the process of hiring me into Linuxcare and giving me the freedom (and funding) to run all over the world getting people on board with what would evolve into the Linux Professional Institute (LPI), today the leading vendor-neutral certification program for Linux professionals. My involvement with leading LPI led to me taking a position with a startup named e-smith up in Ottawa in 2000, which was acquired by Mitel in 2001... and is how I wound up where I am today. I love what I do today and really have Dave to thank for a lot of what started me down the path that led to here. So I've naturally been watching the growth and challenges of Technorati over the past few years. It's definitely done some fantastic things... and also had its share of challenges. I've had my own issues with the site redesign earlier this year. It has, however, provided us with one way to sort through all the zillion things happening out in the world of social media. Given that absolutely anyone can set up a blog and start publishing, how do you sift through all the sites out there to understand what and who matters? Technorati's attempts at Authority and Ranking have been one way to help with that. They will continue to be, but the other reality is that the space they are in, "search", is awfully crowded. 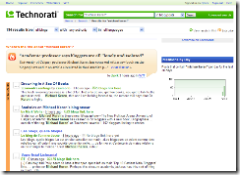 Technorati was the first major site to really focus on searching blogs, but now of course Google and every other search site does that. Technorati's expanded its focus, but so have all the others. It's definitely an interesting time for them, I think. I've been doing startups for almost all of my adult life. And I LOVE startups. I love the teams. I love the sense of mission, and the fast innovation. I love building something from an idea - a whiff of air over vocal cords - into a real, concrete business with real customers and a deep and real sense of corporate mission. I feel incredibly lucky to have gotten the opportunity to do that with so many diverse teams and businesses - SecuRemote, Linuxcare, Sputnik, and Technorati. There's a definite difference in heading up a startup from heading up a more mature company. Kudos to Dave for recognizing - and accepting - that and stepping out of the way so that others can take the reigns and move the company he founded to the next step. Best wishes to the Technorati team and to Dave for whatever comes next for both of them. Huh? 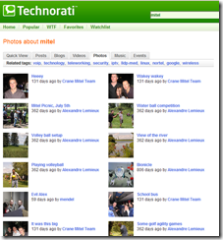 No "date sort" in Technorati photos? Am I imagining this? While I have historically been a huge fan of Technorati, I'm increasingly getting disappointed with the site (as can be seen in my recent posts) and today provided yet another disappointment. Since my employer, Mitel, had a major reseller conference last week, I was searching technorati for postings about the event. There seemed to be a number of photos, so I followed the link for the page of "photos about mitel". However, once there, I found there was no way to sort by date! Did I imagine this? Am I missing some option somewhere? Why should I really care about photos posted 362 days ago? or 131 days ago? (Or even, amazingly, 806 days ago?) How about something closer to, oh, today? When I did scroll down the page I did find a few posted 4 days ago... but that was all the way at the bottom... and there would seem to be at least 6 more pages of photos... would I really have to scroll through them to find more recent photos? Now, I don't really think of Technorati as a place to go search for photos, but that's part of what Technorati aims to be, by their own admission. If they do want to be "the place to go" to search the multimedia web, though, I do think they need to improve things like sort capabilities! I want to see the search results not only in terms of what my be most relevant, but also in terms of timeframe. I want to see new photos first. I know the team there is working hard on improving the site. Hopefully some of these changes will be made. In the meantime, I think I'll pretty much ignore the photo search capability. What's your Authority? Are you considered an authoritative blogger who's fluid prose rakes in link love by the bushel? Now you can proudly display your official Technorati Authority with our new Authority Widget. I assumed that the widget would return your Technorati "ranking". Instead, it returns "the number of blogs that link to you", which is an okay thing to display... but not my expectation. It's also the opposite of the "ranking" in that you want a higher link count. 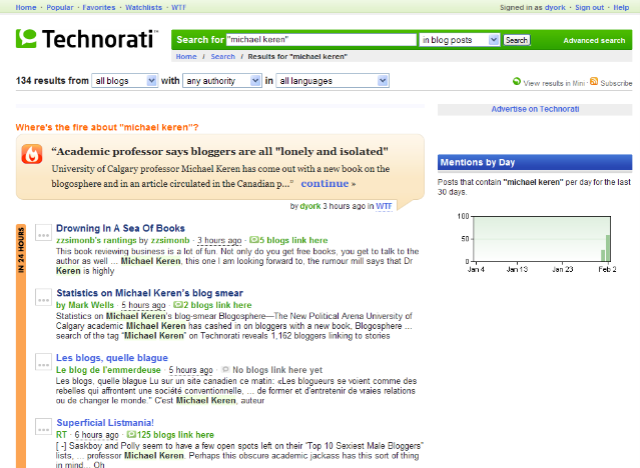 Technorati Ranking: lower is better - ranking of your blog against all others based on some metric Technorati developed. Down side is that widget could get quite huge due to large numbers and there is also little incentive for someone who is #1,891,345 to put it on their blog. Number of blogs that link to you: higher is better - number of blogs that have linked to your site in the last 6 months. Appears to be a major input into "ranking" and is a good sign of potential "authority" of blog. Widget size is probably no issue because count grows up and realistically won't get too high (top blog list currently has high of 26,866). More bloggers might use it because again it is counting up and not on such a massive scale as the "ranking". Number of links from other blogs: higher is better - number of links to your blog from the blogs counted in #2. Useful in that some blogs might link to you many times. The challenge is how to interpret the number. Knowing that a blog was linked to several times by a highly-regarded blog is useful information. Having it linked to many times by a spam blog (or one of the author's other blogs) is not terribly useful. This number would seem very easy to game. Obviously they have chosen #2 for this widget... but my feedback to the Technorati folks would be to clarify in the text on their Tools page exactly what this widget is showing. UPDATE: See my follow-up post about how the "Technorati Authority Widget" does not work like I thought it would. I will be honest, though, and wonder how many people will actually use it outside of the truly "top-ranked" bloggers. I mean, currently this blog is ranked around 42,000, which, out of 71 million blogs, is admittedly quite good. But is it good enough that I really want to clutter up my sidebar with something like that? (As well as adding yet one more thing to delay the loading of my page?) I don't know... I'd need to think about that a bit. P.S. And yes, regarind the "authority widget", I fully realize that Technorati rankings are a very imperfect way of understanding how "important" a blog may or may not be... but until someone else comes along with something better, it's one of the few tools we have in our arsenal, IMHO.